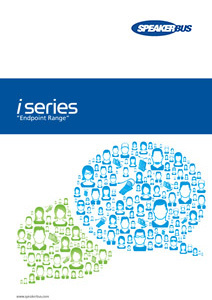 The iSeries is Speakerbus’ portfolio of voice collaboration endpoints, all powered by a software suite (iManager). The iSeries puts you in control of delivering the specialist telephony, hoot ‘n’ holler and private line capabilities which best fit your business needs. Built with open standards and leveraging SIP, SOA and the cloud, to enable rapid voice traffic delivery within existing or new sites. Provides the ability to deploy, configure and manage any endpoint and associated hardware from one central location. A dedicated API to allow interoperability with complimentary voice recording and analytics solutions.